If you’re anything like me, you probably have a big bucket full of broken crayons lying about (please say I’m not the only one!). Over the years I’ve seen many a blog post and magazine article about recycling crayons & always meant to get to this particular activity with my kids. I’m particularly glad we did this one, because it was super easy to do & all three of my kids could participate, or not, as they wanted to along the way. An old cupcake tin. We used one for mini-cupcakes & the size was perfect for little hands. Just note that you’ll want to use an old tin since some crayon brands will leave a sticky residue that’s hard to wash off (I learned the hard way). The next time we try this I’m planning to use the paper inserts to see if that is a bit tidier. Sort your crayons by color. Multi-color is fun, too! Note: it’s best to use the same brand crayons since they melt at the different rates. Chop into kidney bean sized chunks & place in cupcake tin. Heat in oven for five to ten minutes, stirring with a toothpick every once in a while until melted. 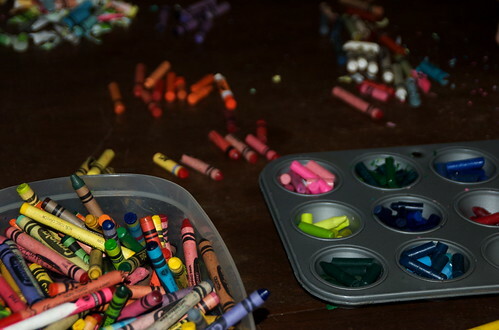 Pop out your crayons & get creative! Note: My youngest found it to be extremely entertaining to break his new crayons in half, which made my eldest very sad. If you have a similar family dynamic you might want to let each kid make their own set.